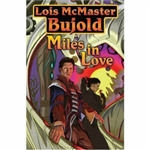 Lord Miles Vorkosigan, youngest Imperial Auditor to be appointed by the Emperor since the Time of Isolation, has a problem all his new power can't solve: unrequited love for the beautiful Vor widow Ekaterin Vorsoisson. Ekaterin is violently allergic to marriage as a result of her first exposure. Includes two complete novels and a short novel.